Are you familiar with cold brew coffee? It seems to be gaining quite a bit of popularity. I was vaguely aware of cold brew coffee and wondered out loud to Patrick if it could be a good option for us to have on hand for our Cookies & Cocoa party. Since we only have our Keurig we needed to be able to have a pot of coffee for our guests. Patrick hadn't heard of cold brew coffee and after some research we decided it wasn't a good option for the party. Our neighbor's coffee machine / pot saved us for that! Part of why we didn't do it for the party was because I only asked him the night before and we would've needed a trial and error research period. We followed the procedure highlighted on this website: 1 part coffee grounds to 4 parts water. Into a one quart mason jar we place 1 cup of coffee grounds and fill the rest with water. We then place the jar into the refrigerator and let it "brew" overnight. Finally strain out the coffee grounds through a coffee filter and sieve into a pitcher and put it back into the quart jar to store. Patrick is a bit more of a coffee snob than I am and didn't enjoy the cold brew coffee concentrate. He did like adding it to his homemade mochas though. I, on the other hand, am not a coffee snob and have really enjoyed making faux lattes with cold brew coffee. To present the cold brew coffee as a traditional cup of coffee you would mix it with water in a one to one ratio. When I make the the faux latte it's at least a one to four ratio of cold brew concentrate to milk. In a small pot (I use a butter warmer) add 1 cup of milk and 1/4 cup of cold brew coffee concentrate and bring to a simmer. Serve immediately. What do you think?? Have you tried cold brew coffee? 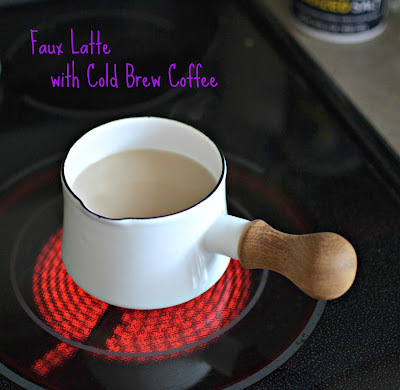 This faux latte is my new go-to coffee drink in the mornings... when I'm not drinking tea of course! I think I was there when you were trying this?! Can't remember drinking any, though.